Sunderland have signed Wolves midfielder Kevin Cooper on a three-month loan deal. And Black Cats boss Mick McCarthy hopes to play him Saturday's Division One tie agianst Nottingham Forest. The 28-year-old has made just one appearance in the Barclaycard Premiership this season but impressed during a trial at Sunderland. "I'm delighted to come to this club - I immediately got a feel for the place," he said. "I've watched Sunderland's progress this season - you tend to keep an eye on the bigger clubs - and they have picked up recently. Now seems a good time to be joining. "I knew the Stadium of Light was fantastic because I've played here before. I cannot wait to do so again." 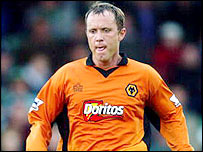 Cooper started his career at Derby before spending spells at both Stockport and Wimbledon. McCarthy admitted his delight at signing the player. The Black Cats boss said: "Kevin showed his commitment to the club by travelling up here on New Year's Day so that we could have a good look at him. "It showed that he has a very good attitude and demonstrated how much he wants to play."